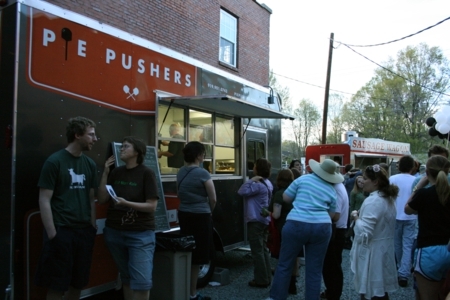 My thoughts on Pie Pushers, a mobile pizza restaurant, went up at Carpe Durham a couple of weeks ago, but I haven’t had a chance to publish them here yet. I tried them out during the Cookery’s open house, waiting in line for at least half an hour—-I was not alone in wanting to sample their food. It almost goes without saying these days that they get as many of their ingredients as they can from NC farmers, ensuring fresh toppings whenever possible. 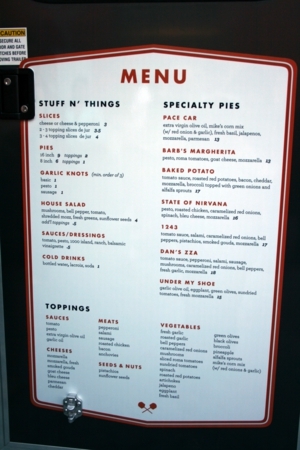 They offer pizza by the slice or by the whole pie with a range of intriguing ingredient combinations. The by-the-slice options change daily, but you can order any whole pizza you’d like to try including simple cheese or pepperoni ones. They also have a house salad and garlic knots-—those knots were going fast that evening! I didn’t try one, however. 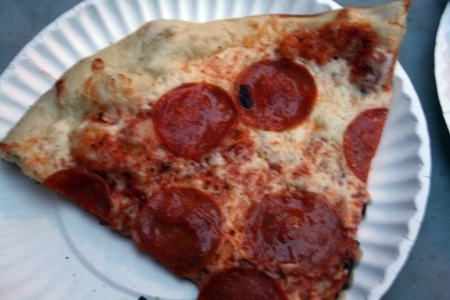 I did have two slices, starting with a pepperoni to try out their basic pie. 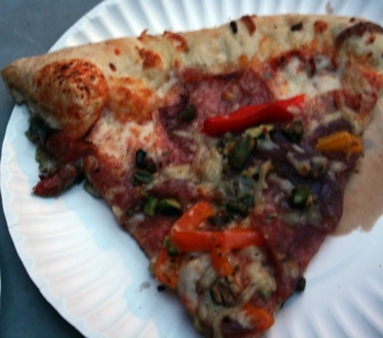 The crust was thin and foldable, which isn’t my favorite type but should appeal to the New York pizza fans. It won me over with its crunchiness despite the foldability. The tomato sauce was bright and only a little sweet, which is a good combo for me. It was definitely greasy, but hey, that’s pizza. My second slice was the 1243 with genoa salami, caramelized onions, a mix of bell peppers, smoked gouda, mozzarella, and pistachios. It was super good. The salami was quality, and in combination with the bell peppers and onions it was wonderful. I love pistachios, but did they add anything to the slice? Nah. I have to appreciate the creativity factor, anyhow. I only wish I had had enough appetite for the Brussel Sprout Pesto slice, too. Yep, Pie Pushers is definitely worth your pizza money, if you like crazy topping combinations as much as I do. Since the less adventurous can make any pizza they’d like from a range of toppings, it’s a good option for anyone who likes a thin crust. I’m still hoping to try Klausie’s sometime, too!